I love this time of year – not only for the cooler days and nights but also for the beer. Many of my favorite seasonals find their way to the coolers in the fall and I will be reviewing them all in the coming weeks. 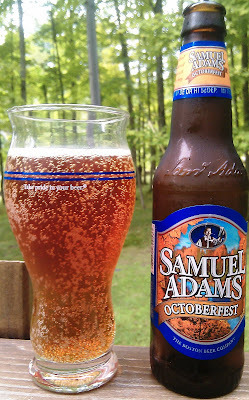 Sam Adams Octoberfest certainly qualifies as one of the best fall seasonals. I happened to find it today tucked in behind a 6-pack of Summer Ale. I bought both 🙂 my last 6-pack of Summer Ale and first Octoberfest of the year. Looking forward to the Gritty’s Halloween, Shipyard Pumpkinhead and Smashed Pumpkin and all the others. Could be a busy fall. Brewers Description: Brewed with five varieties of malted barley for a big, rich flavor.The first thing you notice when pouring a glass of this seasonal beer is the color. Samuel Adams® Octoberfest has a rich, deep reddish amber hue which itself is reflective of the season. Samuel Adams Octoberfest masterfully blends together five roasts of malt to create a delicious harmony of sweet flavors including caramel and toffee. The malt is complimented by the elegant bitterness imparted by the Bavarian Noble hops. Samuel Adams Octoberfest provides a wonderful transition from the lighter beers of summer to the heartier brews of winter.